Find out how what you can do to reduce the risk of danger in your home with our top tips. Home fire safety is extremely important, especially when you live in a tiny house. Small houses are great for minimalistic living, but just like any other house, you need to be cautious when it comes to preparing for an emergency. Most tiny houses are made out of wood and other flammable materials; they also catch fire and burn down much more quickly, so it is wise to ensure that if a fire does break out, it will be put out in no time. Here are a few tips to help you make your house safe for living. Of course, this will be item will be at the top of the list, this device is invaluable and has saved countless lives over the years. They are fairly easy to buy, and you should install them according to the instruction manual. 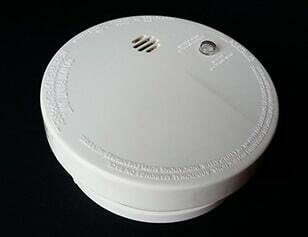 Smoke detectors don’t last forever and it is important to replace them accordingly. Another good idea would be to install a carbon monoxide detector and a propane gas detector; these will also go a long way in preventing a major disaster. It is possible to hook up all your detectors to an automatic control that would alert you to any sort of incident as soon as it happens. This system would need to be installed, but then the system would turn off the source of the smoke, CO or gas, preventing a major accident before it happens; it would also turn off all the power as soon as there is a warning or cause to do so. This is a time-tested insurance policy. You can find them anywhere and in any size, so they can be small and unobtrusive. 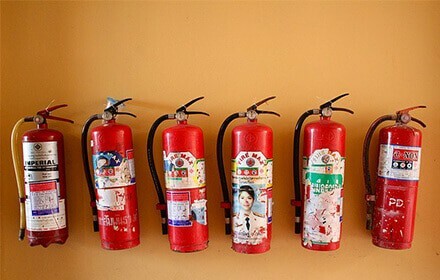 They are also easy and inexpensive to refill; another advantage is that you’ll always feel a little bit better knowing that there’s a fire extinguisher around. A fire extinguisher might not stop every fire, but it is a vital line of defense when preventing a small fire turning into a huge one. 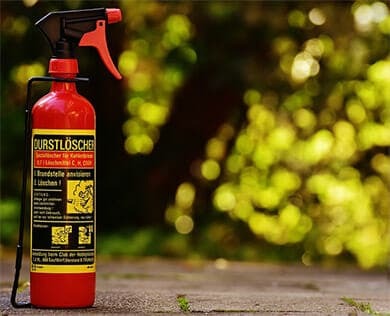 Check out our guide to the best fire extinguishers to find out more. In case of a fire, you’re going to need a quick way out. If you’re sleeping in the loft, then it would be advisable to install a window big enough from which to escape. If not, then an easily accessible skylight is another good possibility. Try and have an emergency rope or ladder nearby too, so that if you need to escape, then you won’t have far to jump when you’re at the top of your house. If your tiny house is made of wood, then you’ll need to look into fire-resistant treatment. This is usually inexpensive and relatively easy to do yourself or have it done for you by a professional. At the same time, have a fire sprinkler system installed. There are many types available, and many modern sprinklers release an organic fluid that is even safe for computer servers, so the damage shouldn’t be extensive. Most tiny homes have a very stuffy atmosphere that can be hazardous and a recipe for disaster. Ensure that your tiny home has adequate ventilation and that fresh air is regularly being introduced. A great way to do that is by adding an exhaust fan. An exhaust fan lessens moisture, prevents mildew and rot. If you’re cooking with a gas or propane stove, then you need to run an exhaust fan constantly. You’d also need to install proper ventilation to improve the air in your home. 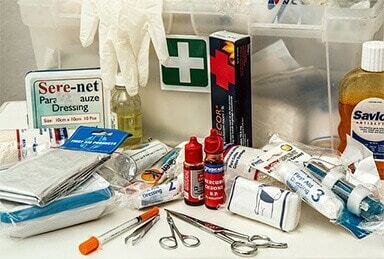 Always be prepared and have a comprehensive first aid kit in the house. Make sure that you at least know how to use the items in your first aid kit. Remember that anything in the kit will only provide a temporary measure, and you’ll need to know where the nearest emergency facility is. Have relevant numbers in plain sight, and make sure that you have an exit access in every room in the house, and ensure that they are accessible and that it is easy to escape in an emergency. If you’re building your home on a trailer, then you need to make sure that it conforms to the necessary safety specifications. You need to have electric brakes installed and make sure that your trailer will be able to bear the load that you’re about to subject it to. The vehicle that you’ll use will also need to be checked to see if it can tow the weight of your little trailer home. When building a small or trailer home, there probably won’t be officials looking over your shoulder to make sure that you’re following all the necessary requirements. This does not mean that you should cut corners. Safety begins at the foundation or the start of the product. When building your home, use the right safety gear and make sure that everything you do meets code requirements; you won’t be sorry later. If you’re going to use a propane tank, make sure that you have an enclosure for it outside. Storing a propane tank inside can lead to countless problems, and it might be a good idea to store it outside. While using a gas stove heater and a propane stove might seem like a good idea, but there are many things that could go wrong, especially in winter. Electricity might be the safest option when building a tiny home because it will not undermine the air quality in your home. If you know what to do when an emergency arises, then chances are that you’re more likely to escape unscathed. Know your exit strategies and exactly what needs to be done, and you could shave seconds off your response time in an actual emergency. A home is where you feel safe, and where you should be safe, but safety starts with you, so follow these few guidelines to make sure that your feeling of security isn’t unfounded. It is easier than you think, and before long, you’ll be living in minimalist style, but more importantly—in safety. Make sure you come back soon as we’ll be posting new articles pretty regularly here at Tiny House, Huge Ideas. If you have any other important fire safety tips, we’d love to hear them!